To celebrate 100 years of radio, application was made to Ofcom for a year-long callsign, this we hoped would be GB100DWC. Some while later we were advised that this had been rejected by their Policy Group and so a quick re-think was required. After a discussion it was agreed we would ask for GB1OOD - Golf Bravo One Oscar Oscar Delta - which would represent 'GB' '100 years' in 'Derby'. Success! It met with the approval of the Policy Group and GB1OOD is now being used throughout the year. From January through to March we operated from the “Silk Mill Museum”located in the City Centre of Derby alongside the River Derwent. Operating was restricted to their opening hours and at weekends only. The original intention was to operate for the whole year from there but a decision by the Council that the Museum be mothballed put paid to that idea. The museum actually closed to the public on 4th April and a listing of how we did from there is available to view from this page. End of March to Mid-July. 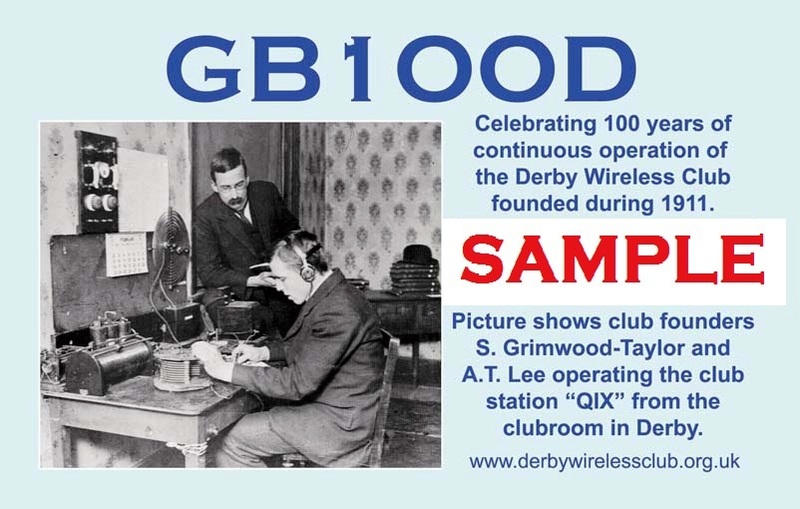 Operation took place from the HQ of the Derby Wireless Club and the Derby& District Amateur Radio Society (DADARS), located at the United Reformed Church, Carlton Road, Derby, DE23 6HE. Whilst there is a lot more freedom in terms of ‘opening hours’ it depends on the availability of operators and also access to the premises as these are also used by other organisations. VHF as well as HF are available to us at the Clubroom whereas the Silk Mill was only able to accommodate HF. Mid July GB1OOD moved for a small holiday, but staying inside the city boundary, when it established on a site for an open-air music festival, this being - ‘Beefstock’which took place on (not surprisingly) a beef-rearing farm.This is a charity-raising event which in past years has raised money for the RNLI; the MacMillan Continuing Care; the Derby, Leicestershire and Rutland Air Ambulance (“DLRAA”). This year their charity was the ‘When you Wish Upon A Star’ charity. Although conditions were poor for radio, the event was a success for the charity with over £3,100 being raised. From 25thJuly to 31stDecember - Operations returned to the Carlton Road URC and during August a display of the DWC’s history over the hundred years was held for a full fortnight as well as operating with the GB1OOD callsign and taking the opportunity to do some late-night operating. The station will continue to operate from the Club’s HQ premises as often as possible until use of the callsign expires on 31st December 2011 thus bringing an end to what is shaping up to be a successful year of celebration. International Museums Weekend - The two weekends of the IMW took place on 18/19th and 25/26th June. Obviously, we would have operated from the Silk Mill but we had to use the station being located in the Clubroom. At least it gave us the opportunity to work some of the stations located in various museums across the country. Churches on the Air (CHOTA) - As the Club’s HQ is located in a Church hall then we registered with WACRAL (World Association of Christian Radio Amateurs and Listeners) for this even held on Saturday 10th September. The Church was also celebrating the 80th anniversary of the laying of the Foundation Stone on 12th September, so it was a good opportunity to support both events. Again GB1OOD was put on the air. Railways on the Air weekend - Rather than use GB1OOD for this event (and having to go through the process of changing the NoV’s to do so!) it was decided that our visit to West Shed (the home of the Princess Royal Class Locomotive Trust) at Swanwick near Ripley in Derbyshire would be a good opportunity to use GX3ERD/P, one of our club callsigns, “RotA” as it is sometimes referred took place over the weekend of 25th and 26th September and a small but elite team operated from their premises. It is suspected that other club members were preparing themselves mentally for the display we were to put up the following weekend at the National Ham Fest at Newark! Most of the contacts during “RotA” were on 40m and the band was very busy! GX3ERD/P worked a majority of the other registered radio stations as well as talking to members of the public which is just as important – if not more so. Derby Wireless Club celebrated 50 years of continuous activity back in 1961 in a similar way. At that time, an exhibition was set up at the Derby Museum and Art Gallery during August 1961. A 32 page Booklet was produced called "Fifty Years of Radio" providing information regarding history and an introduction to Amateur radio. Today we have the internet.